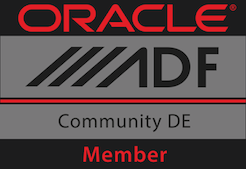 Oracle has invited anyone whois interested in intense ADF Development to attend at an ADF Hackers Event called ADF Fitness Center. It will take place in the Oracle office Munich from 24. till 25 Jan '13. Participators can take advantage of expert knowledge by bringing their current ideas, prototypes or use cases with them. It will also be possible to deploy on an Exadata and Exalogic infrastructure. Hopefully I'll be able to attend.